“Taking screenshot is not allowed by the app or your organization” What? I wonder which other organization is managing my screenshot app. My heart palpitated a bit faster when I “Couldn’t capture screenshot” with my app anymore. With my years of using the Android OS, I have never experienced this problem before. Well, it is a good thing that I experienced it so I can find the solution for myself and other Android users who may be having this same screenshot capturing error. But not to worry, if you couldn’t capture screenshot because of this error; I have found a permanent fix for it. No need to panic as I did. And until you read through this page, you will not know how to take screenshots on apps that disabled the screen capturing. Irrespective of the Android OS that you are using, you may still have this error message while trying to capture screenshots of SOME apps with your Android mobile phone. I experienced this when I was using Android version 7.0. You may experience it on an older or a later version of the Android OS. 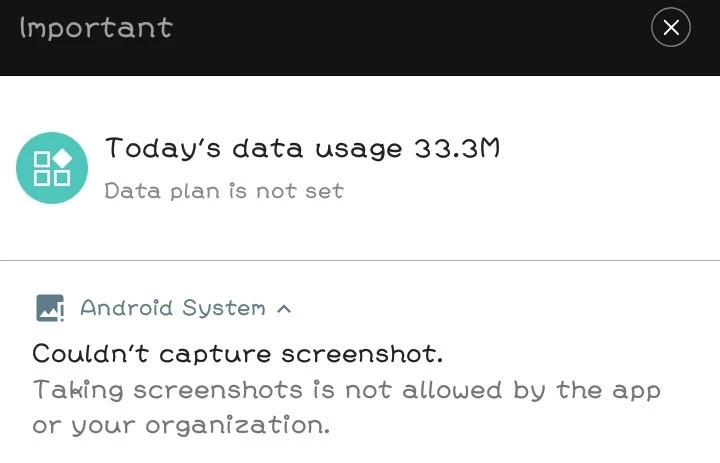 Your Android version does not really matter here because all of us from our diverse Android versions will get rid of the error message that taking screenshot is not allowed by the app or your organization so we can start capturing screenshots on our Android phones once again. Before I share with you what could be the possible solution to this problem, it is good that you, first of all, know the cause of the problem so you know how to tackle it. Knowing the cause of the problem will help you get to the root of the issue and get it permanently fixed. Just so you know, for security/privacy reasons, there are some apps within your Android device that automatically disables screenshot capturing. So you can not capture the screenshot of these app screens. One of the apps that could disable your Android screen capturing is the Telegram secret chat. Oh! I just remembered, Chrome incognito for Android also disables screen capture, too. If you try capturing screenshots of other apps, it will work just fine. Okay, just try to capture the screenshot of this page now let’s see. The reason why screen capturing was disabled on your telegram secret chat page is for privacy reasons. It’s a secret chat so you’ve got to keep it secret, taking the screenshot of the page may expose the information contained there and the idea of the secret chat will be forfeited. Disabling screen capturing in certain apps like the ones I just shared above is one of the features of your device screen capturing app. You’ve got to leave with it that way so that private/secret intended content can stay that way. Even if I should know a way to get over this, I’m not quite sure I’d incite someone to defeat a privacy measure. Don’t forget to share your thoughts in the comment section.